The caimans belonged to someone living in one of the favelas. File photo. 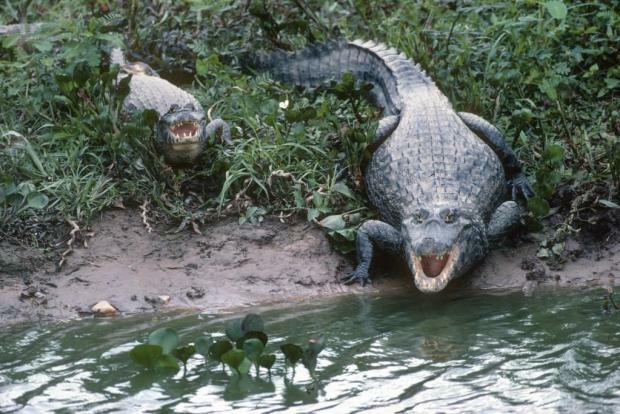 The cold-blooded creatures - smaller relatives of alligators - belong to a resident of the Rolas favela in western Rio, and escaped on Tuesday when a wall holding them in burst when struck by a flash flood. An animal control team has been mobilised to re-capture the reptiles, the Rio environmental services office told AFP. How many were on the loose? Officials did not say. The team faces a risky task: not only must they be wary of the aggressive animals, but they must navigate streets knee-deep in water or slick with mud, dodging uprooted trees and loose power lines like the one that electrocuted a man to death near where the caimans escaped from. They also face more mundane dangers, such as being shot, knifed, mugged or kidnapped in the high-crime favela. As of Wednesday the team had been unable to enter the favela "due to the strong presence of drug traffickers," city officials said. "I saw the wall collapse and two people have already seen caimans at their front door," a local resident wrote on social media. The unusually heavy rain,which began late Monday and continued into Tuesday, has killed at least 10 people, officials said. The rain triggered flash flooding that turned some streets into raging rivers, uprooting trees and sweeping away vehicles.